This painting is a portrait of Nadir Shah Afshar, one of the most important figures in Persian history of the last 300 years. Nadir Shah began as a tribal leader. He tried to use his forces to restore order after the Afghan invasion of his country in 1722. At first, he worked in the name of members of the previous dynasty, the Safavids. In 1736, however, he declared himself shah, and he ruled with some success until his assassination in 1747. This is one of only two portraits of Nadir Shah in oils that survive. The Shah is shown wearing jeweled armbands, which are thought to be from the Mughal treasure. The carpet on which he sits is also Mughal. The painting is therefore attributed to the period after his invasion of the Mughal empire in 1739. 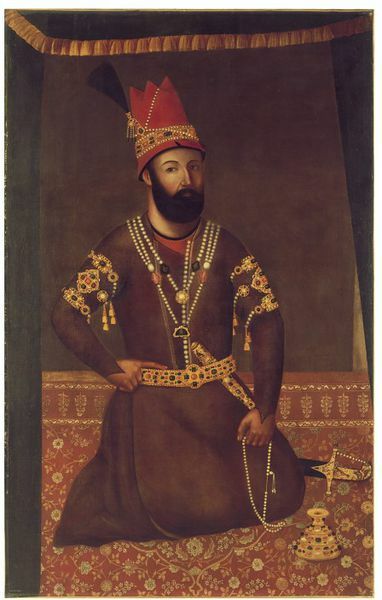 There are some resemblances between this painting and watercolor portraits of Nadir Shah and a young man, probably Nadir Shah's son, by the painter Muhammad Riza Hindi.